Why would you want to be in England in late March when you can be in the South of France where the air is balmy and the sky that colour that gives the coast its name, azure? We were visiting the villas and gardens of the coast. Here is Lawrence Johnston’s “other” garden at Serre de la Madonne in the hinterland behind Menton. A terraced garden rising up from the narrow road which winds its way towards Gorbio. 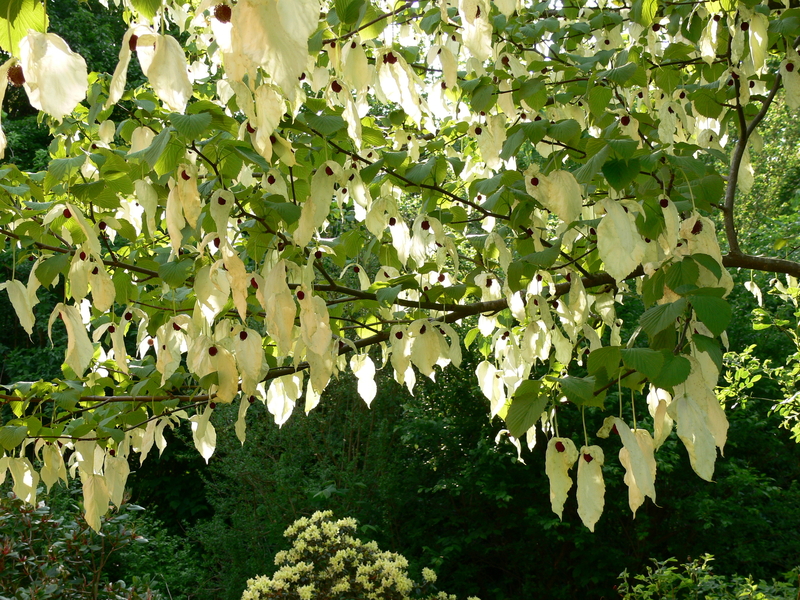 As you walk upwards towards the ochre-coloured house you pass through a bamboo shaded area via the pool-terrace with strelizias of vast size, and a glasshouse filled with orchids, until you reach the terraces of the house itself. Over all hangs the scent of freesias which grow with abandon in every flower bed. What poor specimens are those spindly things purveyed by the supermarkets! 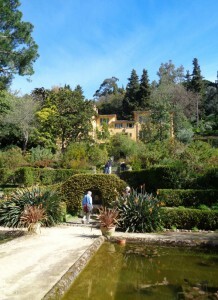 Not far way, across the Italian border, at Ventimiglia are the Hanbury Gardens at La Mortola. A very un-English garden which plunges down to the sea, but created in the mid-19th century by an English merchant, Sir Thomas Hanbury, unwilling to return to the fogs and ice of his native land after making his fortune in China. 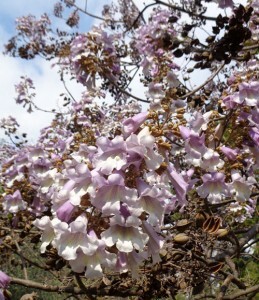 This garden is now looked after by the University of Genoa and abounds in wonderful plants including this Paulownia, which was in full flower, pale mauve and white flowers, like giant meringues. Down we walked with our excellent guide, marvelling at all the extraordinary abundance that is in flower, in March on this fortunate coast, grevilleas proteas ,hellebores, mahonia, agaves, peonies, arum lilies clivias, all gaily flowering at the same time like some Dutch still-life featuring flowers irrespective of their season. Strangest of all are the palm trees which survived the onslaught of the war which are pock-marked with bullet holes. An odd sight in this idyllic spot. 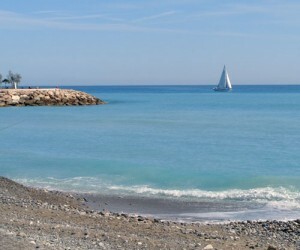 Another Englishman who retired to the coast was Sir Percy Radcliffe at Villa Val Rahmeh, near Menton. Sir Percy, sometime Governor of Malta, came in 1925 to this most English corner of the coast and created a garden which is now an out-station of the Jardin des Plantes in Paris. Its sense of intimacy as a private home is not impaired as you wander its circuitous paths amidst colossal bamboos and palms. The terrace offers a panoramic view to the sea, and a lower terrace reached by a bridge where lilies flourish in the round pond. The star of the visit has to be, of course, the Villa Ephrussi at Cap Ferrat. Here the capricious Beatrice de Rothschild created her third, or was it fourth?, home along this coast. Whether you like it or loathe it this mansion sets a standard which is hard to beat. The collections of French 18th decorative arts are hard to surpass in this area, with the collection of Sèvres porcelain being particularly notable. Notable too are the gardens, admirably maintained by the Institut de France, featuring a rose garden, a Japanese garden, a stone garden (left over pieces of sculpture), a Florentine garden and a succulent garden, all reflecting, one suspects, the magpie instincts of the very rich Miss Rothschild. The musical fountains are perhaps an acquired taste. This is a luxurious and self-indulgent property which sets the mood of the Côte d’Azur in its heyday. The next two journeys to this beguiling part of France leave on 29th October 2015 and 18th April 2016. Please see website www.traveleditions.co.uk for details of the itinerary and booking arrangements.